April is the perfect time of year to get a backyard, garage, balcony or basement mushroom production started. With the snow finally melted and the worst of winter behind us, The Captain and crew set out into the forrest in search of recently fallen red (left below) and white oak wood (right below), ideal substrates for Shiitake mycelium to produce mushrooms. Mycelium are the thin little fibers that decompose the wood and eventually produce the mushrooms that pop right out of the log. This is what happens behind the scenes whenever you see a mushroom. In strong logs such as the oak pictured above, mushrooms will fruit about 2 lbs/log every 6 months for roughly 5 or 6 years. So, you drill some holes, you save a lot of money and you get some unbelievable mushrooms, seems pretty straight forward to me. 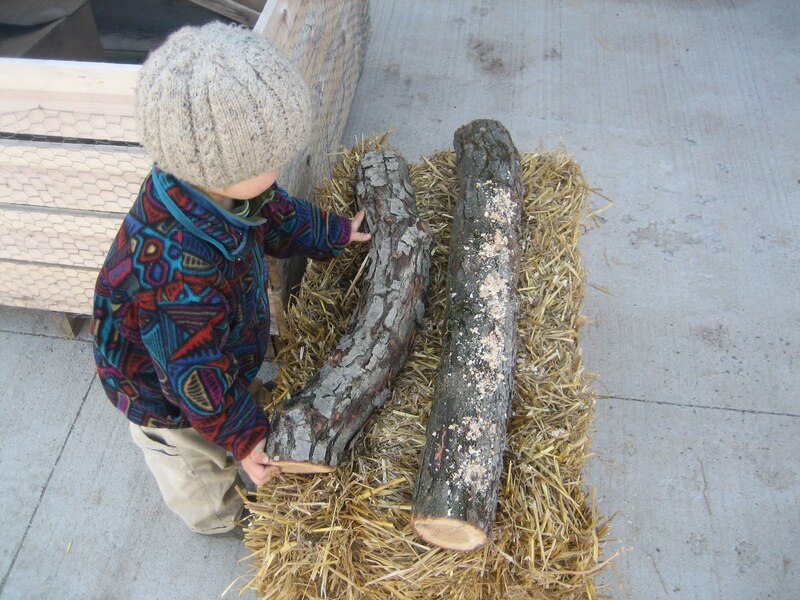 As we learned, Shiitakes are saprophytic, which means they thrive on decomposing organic matter such as wood logs. Shiitakes are of Southeast Asian origin and derived their name from the Japanese Shii trees that produced them. Fortunately, the Shii most closely resembles our white oak trees here in the Northeast US, which just so happen to literally surround the farm. It's important to make sure the logs aren't too fresh or too old, about a month after falling seems to be just right. 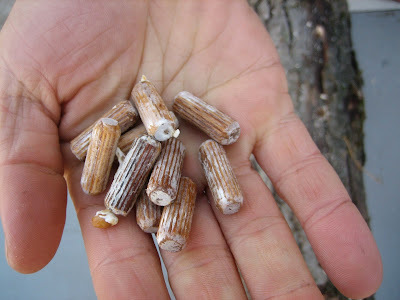 For the Shiitakes, we used mycelium that was cultivated on small alder wood dowels for the purpose of home production. The dowels are used as a medium for hosting the mycelium as it is shipped from the producer all the way to your home. After gathering the wood, you want to drill small holes, the size of your dowels about 3 inches apart all the way around. Once the holes are drilled you simply "infect" the now "wounded" log by hammering in each dowel. 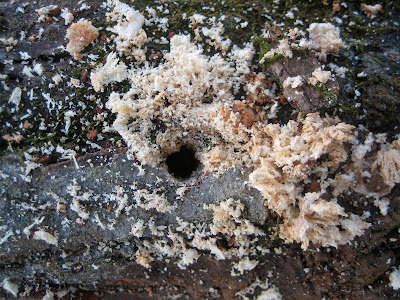 Any hole drilled (even by accident on your first log when you got drill happy) needs to be filled or covered to prevent the infiltration of unwanted fungi or other organisms that may try to take advantage of the dying wood's last nutrients. Just like a human, any open wound is extremely vulnerable to infection and since we're trying to grow Shiitakes in these logs, it's best to reduce competition. Saprophytic mushrooms generally have medicinal benefits and there have been some studies showing that both Shiitake and Oyster mushrooms assist in the defense of the spread of certain cancers and contain high levels of antioxidants. These juices below show that there is still life left in both the wood log and the mycelium dowel. A good sign for sure. Finally, once all the holes are plugged, we took some cheap reheated cheese wax and lightly brushed it over each wound creating a band-aid-like cover. But what happens after these logs stop producing mushrooms? Well as we all know, there is no waste, only potential and saprophytes such as Shiitakes and Oysters will decompose the wood until all that is left is soil, obviously a key component to the next stage of plant life. Unlike Oysters, Shiitakes are not agressive, weed-like mushrooms so they need some help getting started. It's important to keep them in a dark, moist environment where they can get a lot of rain or at least a good watering once a week. A good trick for greater production is to knock them around and shake them up. This odd process will help breakdown the mycelium colonies, which then reform even stronger, producing a greater amount of Shiitakes. Shiitakes are known to have a good source of B Vitamins and iron. Always cook mushrooms before eating to unlock the goodness.